Hash browns are perfect for a healthy, low-carb, and super-quick supper or lunch. They are flavor-packed, fresh, tasty, and vibrant and can be served as a main dish or breakfast. Breakfast-style bacon and cauliflower hash browns are crispy and creamy and fluffy on the inside. 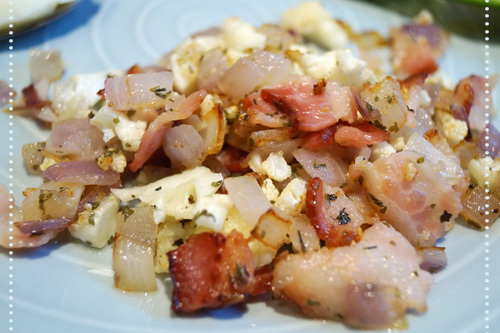 Known as the Holy Grail of Breakfast, this is a low carb version to include in your menu. Bypass potatoes to make this deliciously simple, diet-friendly breakfast packed full of healthy ingredients and flavors. This nutritious and easy to make dish can be served with fresh vegetables. Preheat oil in a medium nonstick skillet and saute the onion for 2 - 3 minutes. Add the bacon and cook until brown. Stir in the cauliflower and cook for several minutes or until tender and light brown. Soften or melt the butter. Then add butter and stir. Butter speeds up cooking and browning. Add lemon juice and cook for 1 - 2 minutes. Season with salt and pepper and sprinkle parsley on top. You can also add paprika. Serve as a breakfast side or make fried eggs and serve with the hash browns. You can also combine with roast beef or bratwurst for a satisfying meal.